As a fan of Westerns, I've always wanted to play Boot Hill. I've owned a copy of the Second Edition of the game -- the one that came in the box and was published in 1979 -- for many years, but I have never had the chance to sit down and actually play a session of the game. This isn't to say that the players I have gamed with over the years haven't been up for Western themed gaming. I've played sessions of Avalon Hill's Gunslinger (not an rpg) and sessions of Deadlands. We've always had a good time. I've just never had a chance to play Boot Hill. This being the case, it wasn't until recently that I began to read the rules to examine them for play. The Old School Renaissance, combined with the recent release of Dungeon Crawl Classics, got me into a nostalgic mood. So the other day, I opened up the rulebook to learn how to play so I could pitch a session to my gaming group. 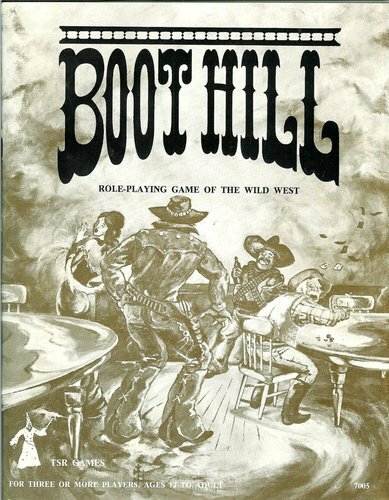 The first thing I noticed was that while Boot Hill is a role playing game, it is largely a Tactical Tabletop game. The campaign elements while "role playing" oriented also allow for players to play against one another -- but doesn't require it. Some players will play "law men" and others "outlaws." This isn't to say that one couldn't create a more "PCs are a team" style campaign, just that the rule book is written to allow for player dictated storylines where other players can react. The campaign system is set up so that the individual players can play their own individual stories regardless of other players' activities. I think that this mode of campaign play is interesting and definitely echoes the style of a Braunstein game more than the D&D rules did. One of the things that many in the OSR community find appealing about old school games is the lethality of the systems and the lack of "superheroic player characters." OSR players often want the characters played by players to feel some what mortal. This sentiment likely stems from the fragility of 1st level characters in D&D, especially Magic Users who are notoriously fragile at low levels. PCs in a 1st edition D&D game are often one small mistake away from death. In fact, in the first D&D rules set while characters where rated for their physical and mental attributes, having highly rated attributes had little effect on game play in comparison to later games. A Fighter with a high Strength score gained very little immediate benefit from the score, though that character would gain experience more rapidly than his/her compatriots. It didn't take long for that to change though. It was in the Greyhawk supplement that added ability score modifiers for combat. And once a character's strength score affected one's combat ability, every player wanted to have a higher strength score. After all, who doesn't want to hit opponents 10-15% more often and to deal 2 to 6 more points of damage per hit? 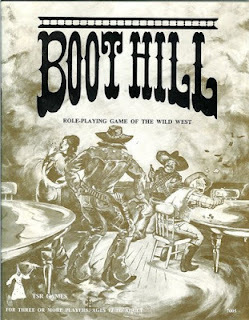 The 1979 rules of Boot Hill definitely demonstrate the transition from ability scores being primarily a measure that influences speed of advancement to things that immediately and directly affect combat. D&D used a bell curve that was close to a Normal Distribution with a range of 3 to18. The bonuses roughly falling along lines of standard deviation especially in the Moldvay/Cook edition. Boot Hill, on the other hand, has different distributions for Non-Player Characters and Player Characters based on percentile rolls. Player Characters are far more proficient than randomly generated NPCs. Take a look at the following two tables illustrating the probability of a character having a specific "Speed" rating. The first illustrates the chance of a randomly generated NPC having a given modifier. These range from - 5 to +22 and 0 is described as "average" in the descriptor. The second illustrates a Player Character. Once again, 0 is "average." Two things stand out to immediately. The first is that the character generation system doesn't generate "average" characters on average. An NPC has only a 10% chance of being "average," and has a 15% chance of being "above average" or "fast." PCs are even more powerful than NPCs, as they are completely incapable of being "average." Given that the -5 to +22 is a modifier to initiative, and that one sees similar though not identical distributions for Gun and Throwing Accuracy, one wonders why the game's mechanics didn't scale down toward average actually meaning average. This could have been done by deciding that a majority of NPCs have a speed of x, and that the majority of PCs have a speed of y. The speed of x could have been called average and have provided no bonus or penalty. Instead, Boot Hill uses a counter intuitive system where an average roll (50.5) results in a "quick" NPC (+4) or a "Very Quick" PC (+6). A part of me could forgive the non-intuitive use, if it wasn't for the section of the rules listing "The Fastest Guns That Ever Lived." According to this chart, Billy the Kid has an unachievable Speed of +23 and even Ike Clanton has a +12. All of the "Fastest Guns That Ever Lived" are extremely fast and seem to me to reflect a kind of power creep in the rules. What is most remarkable is how many of these characters have Speeds of 18+, with many having more than 22. One might say, "but they are the 'fastest' aren't they?" Okay, but does the name Bob Younger really bring to mind speed with a pistol? Besides, the point of having these gunslingers listed is for use in the game. If all of them are so quick, then there is no real distinction among them. The slowest of the fastest guns has a +6. Why not set +6 as average? It seems to be the average of the NPC distribution -- or at least close. I can say that the first thought I had looking at these numbers was that none of my players would want to even try a character who didn't have at least a +9 in their Speed Stat. I think that a system having bonuses that directly affect the probability of actions makes players more likely to worry that their stats aren't high enough, and to try to power game a system. As time has gone by, I'm becoming more convinced that maybe statistics should matter less mechanically than they do. Players might obsess a little less about what their Speed score is if they aren't worried about someone with a +25 (Wes Hardin) bringing the gun to bear. Oh...and the list completely leaves out Bass Reeves. How can you leave out Bass Reeves? While a great opinion peace on the mechanics, I would like to point out where you have messed up. The thing that you have to realize is that there are a LIMITED number of special gunfighters. They are listed historically by dates and place. Even picking the most 'populated' places and times, these gunfighters are most likely to ever be seen by your created characters. Also, no one wants to have everything handed to them. When I approach an extreme level in boot hill, I am expecting great difficulties and challenges. If your only comments hinge on players being afraid they are not fast enough, then GOOD I say. GOOD. And if the players want to fight 'equal' npcs then they simply start a life of gunfighting and challenging other gunfighters and BELIEVE me, as in the field of dreams, they will come. Johnny Smith from Akron Ohio who sets up his jewelry shingle in a one horse town has the greenhorn skills he needs. Play the game before writing a terrible review. It was the 2nd roleplaying game ever made. Its creators knew what they were doing. First, thanks for your comments they are useful and they obviously come from someone who has played more than a few sessions of the game. Second, if this analysis seemed like a "terrible" review, that was far from my intent. I think the game looks fun and the inclusion of Braunstein style play intrigues me as the players battle one another. My only real "problem" was that the descriptors of capability don't seem to match up with actual probability so a renaming of the attributes would be good. With regard to your comments regarding the fastest guns in the West, your points are well taken but I would still point out that I think they are over-inflated as some have stats that are impossible to achieve even after long play. That smacks of "DM-centric" design and a need to prevent players from becoming too special. There is definitely room in gaming for that kind of play, but I'm just pointing it out. As for your assertion that by the time the 2nd RPG ever made came out its creators knew what they were doing...I don't know that one follows from the other. The first RPG is nigh unplayable as written, though highly playable as played. Trying to understand White Box D&D for the non-rpg player is very difficult as it doesn't explain much. In fact, there is much discussion on the internet regarding how one would even begin to play using the Chainmail combat rules. None of this means that either is a bad game, I love OD&D for example, just that they have a learning curve. When my group plays a few sessions of Boot Hill, I'll write an additional post. But let me reiterate, I think the game looks great it's only the descriptors that seem lacking which is a small complaint indeed.